A Peek Into Our Year So Far! Welcome to all of my Casa parents old and new! It's been awhile (like a whole year!) since I've blogged and I'm so happy that I have the time to sit down and get back at it. I think its a wonderful way for you to stay connected to the our classroom and see what your children are spending their days doing. The first month of school is flying by and already we have so much to share with you. The children have enjoyed reviewing lessons from last year, learning how to read a map and most of all, apple tasting! Our days are busy and we've already started into a great routine. Our French time is now in the afternoon and the children are lucky to get four French classes a week. Mme Darby keeps them busy singing french songs, playing games and learning lots of new vocabulary. Lately I've been hearing about 'pommes'! Each Wednesday the children have been enjoying a yoga class taught by yours truly. They all get excited for this so it is something I plan on doing throughout the year. On Friday's we get a visit from Mr. Tannahill and his guitar (or whatever instrument he fancies that day!) and last week they had their first music class. It was a big hit and will continue throughout the year as well. Here are a few pictures from the first few weeks of school. Please feel free to comment at the end of the blog and share it with your friends and family members! Speedy was sure happy to see his friends! The girls had to check and see if any new items had been added to 'I Spy'. To their delight there has been! Miss Emily made us lavender scented play-doh. Great to get those fingers working! Making words with our moveable alphabet! Miss Kelly celebrated a birthday so the Casa's went on the sly and made her a card. Miss Emily Rowcliffe is in this picture. She is a new teacher at the school and we're delighted to have her here each day! Some things never change. . . like the fact that the Casa's love carrot cutting! I spend my days with a bunch of little rabbits!! Maybe this is why they're so good a bunny breathing in yoga class! Sometimes cleaning up a spill requires a little team work! 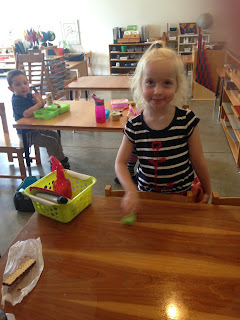 The children are responsible for cleaning their area when they are done eating. Bryce is happily sponging the table after carefully sweeping it. The Casa children fold the laundry for the whole school. Drawing will never go out of style for the Casa kids! Making music with Mr. Tannahill! Thanks for visiting. See you all tomorrow at the ice cream social!! It's the top of the 9th and we're on the home stretch to SUMMER! Well the children are still singing "Take Me Out To The Ball Game", a favourite from the Spring Concert. So I guess you could say that we're at the top of the 9th and the game is now winding down. You wouldn't know it though. The children seem to be more focused than ever and little "explosions" and "a-ha moments" are happening all over the classroom. All areas of the classroom have been on fire! Have a look. . .
Sophia is becoming a reader! Petra is working with Colour Box #2. She has just moved the little black turtle onto the grey tablet and will go and retrieve it's match from a nearby table. This is challenging for a two year. She has to hold in her memory that she is going to get the grey tablet. This can be a challenge for a two year old because of all the other distractions she has to walk by to get there! Emma is using the little black turtle as well. An added challenge to the cylinder blocks, she is not only retrieving the cylinders from a distance, she is looking for particular cylinder. Abby has been learning about adjectives and nouns. In this activity I asked her to go the farm to find me 'the horse', which she did. Unfortunately it wasn't the horse I was thinking about. I gave her the adjective brown and she was able to find it. I was thinking about 'the brown horse'! Subtraction with the bank game! I was the banker with 7869. Abby and Olina came along and took away most of my quantity and left me with only a little bit. That's subtraction! This concrete way of teaching math operations is so effective and important for children this age. The younger Casa's have been adding in the symbol (letter) to our I Spy sound games! 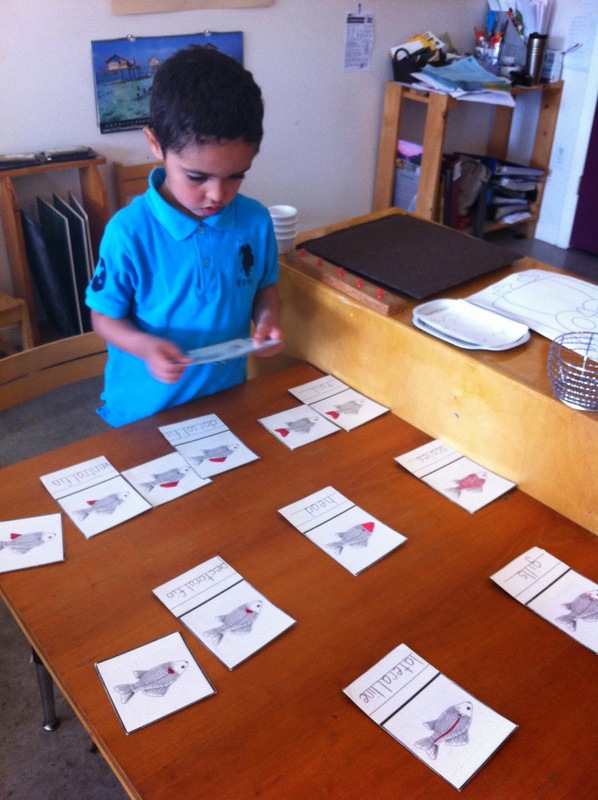 Muhammed has been learning about the parts of a fish. Lots of new vocabulary like lateral line and pectoral fin! 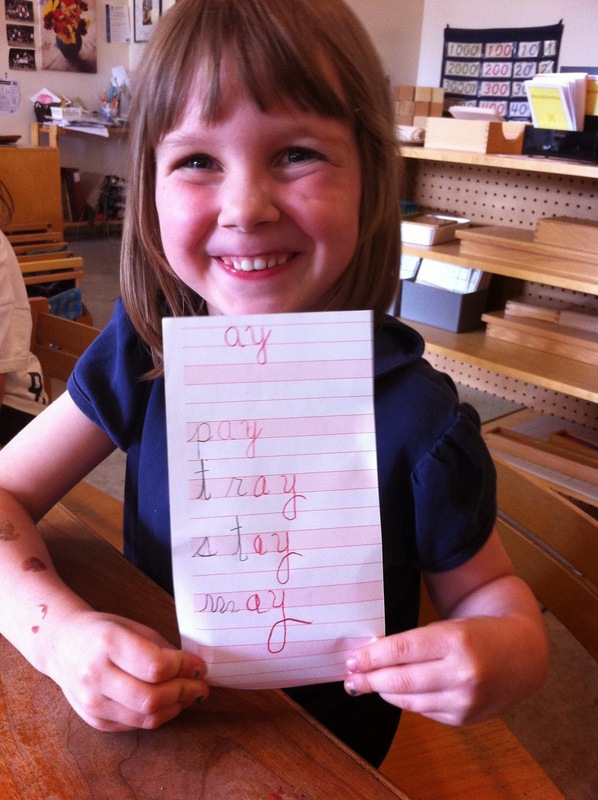 Chloe learned her first phonogram. . .sh! 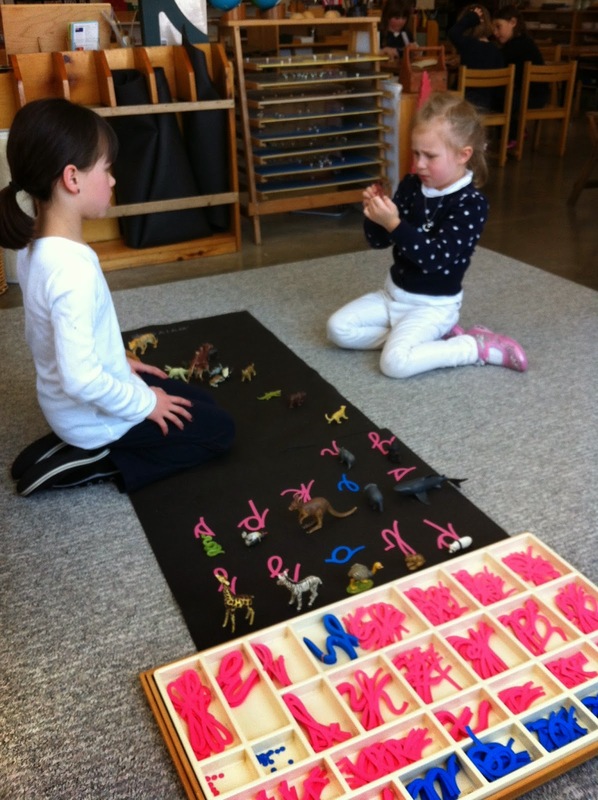 Violet and Abby are placing animal cards with their continent of origin. Some of the animals have tricky names but Abby did very well reading each card! Brody found a small dog figurine out on the playground. Dirty and needing some attention, he patiently scrubbed it clean with a toothbrush and some dish soap before adding him to our farm. An easy activity that promotes fine motor control and concentration. Fill up a bucket this summer and let your kids wash all of their toys! Muhammed is learning about tens! The younger Casa's have been doing Handwriting Without Tears activities daily. In this photo, and the next, they are doing the hello song, learning how to shake hands and look someone in the eye. Hello Jonathan! Hello Emma! Not only do we make phonograms with the storyboard, but when we're ready we write them down. Way to go Olina! We've been enjoying learning about germination and the life cycle of a plant. Lessons and activities related to this topic will continue this week. Violet working on a counting activity related to germination. Olina and Abby looking for the nouns in a sentence. Olina's mom happened to be at the school when the girls were doing this. She was amazed at the work and commented that she didn't think she learned this until high school! The next two weeks are sure to be just as busy. I'm getting final homebooks ready to go home and look forward to seeing all of you at the end of the year potluck! For those of you planning to travel, even if it's just a day trip, here is a great blog by "Little Passports". Five tips for travelling with children this summer. #1 Give your kids some ownership: Kids love to be given responsibility. Why not let your kids take some ownership in the vacation planning stage? Depending on their age, this could mean a few things. 1) Provide three destination options and let the kids choose their favorite, 2) Do the research together on hotels, fun activities and places to eat, and let them help craft the itinerary, or 3) For the older kids, give them a budget and let them take the role of Travel Director. This can spark great conversations about budgeting, prioritizing and compromising. You will always have the veto power, so make sure your kids pick a location that is good for both adults and children. Fun Fact: Little Passports Co-Founder Amy Norman has been planning all of her family holidays since the age of 12! #2 Don’t let GPS take control: Most cars today have a GPS, whether it’s built-in or sitting on the dashboard. Some days we would literally be “lost” without them. But do you remember the road trips of your childhood? The route was planned on a map in the days before the journey, and someone was always holding the map during the drive and instructing a ‘left here’ or a ‘right up ahead.’ Here’s your chance to turn off the GPS, and let your little ones practice using a map as they guide you to your destination. #3 Make a master list of everything you will need for traveling: 1. Diapers, 2. Kid’s headphones, 3. Goggles…every time you travel, you can pull out the list. This shaves at least 30 minutes off your packing time with each trip. We promise! Keep the list electronically or hand written, and make sure to add/update items as your kids’ needs change…at some stage diapers will get replaced by coloring books and iPads! If you are really organized, why not keep a travel kit ready to go for the kids? Include items such as travel sized toothbrushes, toothpaste, hairbrush, shampoo and soap. Then you don’t need to think – you can just grab the bag and go! Don’t forget to restock it when you get home. #4 Build in time for your family to get over jet lag: If you have a long flight planned, don’t forget the impact of jet lag. Know your time zones and leave plenty of room for recuperation, or you’ll run the risk of cranky, crying children (and parents!). #5 Don’t cram too much in your itinerary: Don’t over-schedule yourselves with activities and multiple daily stops. Kids can get tired and cranky fast! It’s more important that your family is spending quality time together, and not that you’ve checked out absolutely every must-see landmark that your destination has to offer. Keep the itinerary flexible – sometimes it’s the “accidental” stops that end up being the most fun and memorable. Don't forget to also inquire about our 'Summer Fun Camp' and spread the word to your friends! Miss Danette and Miss Brittany have some great activities planned! I blinked and it was May! It's been a while since I sat down and wrote to you. . . time flies when you're having fun right? This certainly rings true for the classroom. We've had new students join who are just beginning their Casa adventure and third year students who are preparing for the next phase and lots going on in the middle. I wish that I could capture all of the exciting moments that are happening each day and hope that your homebooks are giving you a little glimpse into just what goes on at school. Here are some photos from the past few months to give you all a little better idea of just how busy we are. Right now we are practicing for the Spring concert and Ms.Mahoney has started doing Kindermusik on Fridays with the children. They are delighted by this and I think she feels the same! Addie watching as Brody practices moving the ball around on the balance board. Muhammed learning the difference between a lake and an island. Olina showing a very proud smile after mastering the letter 'j'. Cursive writing books have been a hot commodity lately and are being worked on everyday in the classroom! Abby working on stamp game addition. Math in the classroom has been progressing for everyone and its exciting to see all of the different activities that are going on. 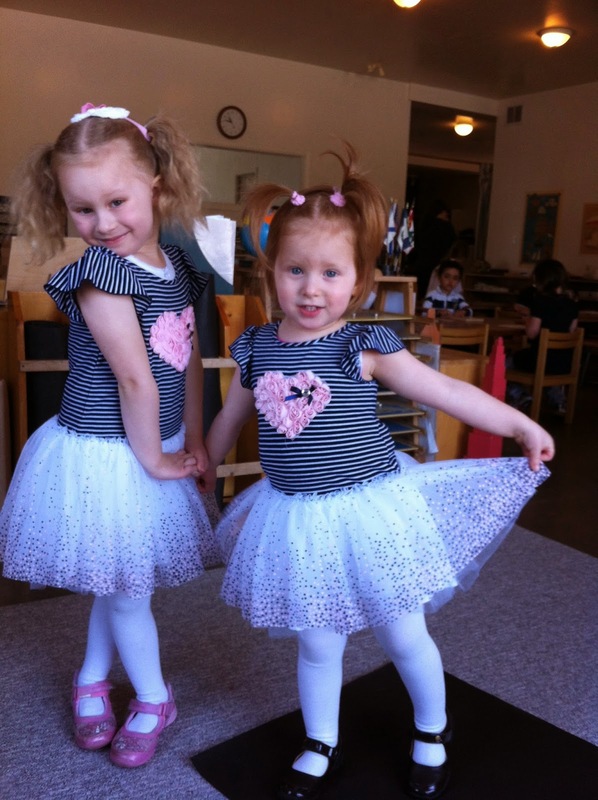 Sophia's sister, Petra, joined our class in April! The cuteness factor in the classroom has definitely gone up! From tadpole to frog. I did this lesson 5 times in a row at the request of the children. "Miss Kate, again, again!!" Perseverance, patience and a little guidance helped Chloe and Sophia complete the 100 board. A few mistakes but this is an activity that they are sure to do again. Locks and Keys for another of our new friends, Quinn! Abby correcting her work all by herself after completing the Addition Strip Board! We all really enjoyed spending the afternoon at the Culture Fair. The juniors and seniors put on quite the show for us and it was truly amazing to see all of their hard work up and on display. We sometimes get a little help from our older friends. Maddie came to visit from junior one day and ended up spending the whole afternoon working with Sophia and the Moveable Alphabet. We get a little help from our friends! Sophia took special time at lunch to give Addie a lesson on washing her placemat. Jonathan is strengthening his hands with a little sponge squeezing!! 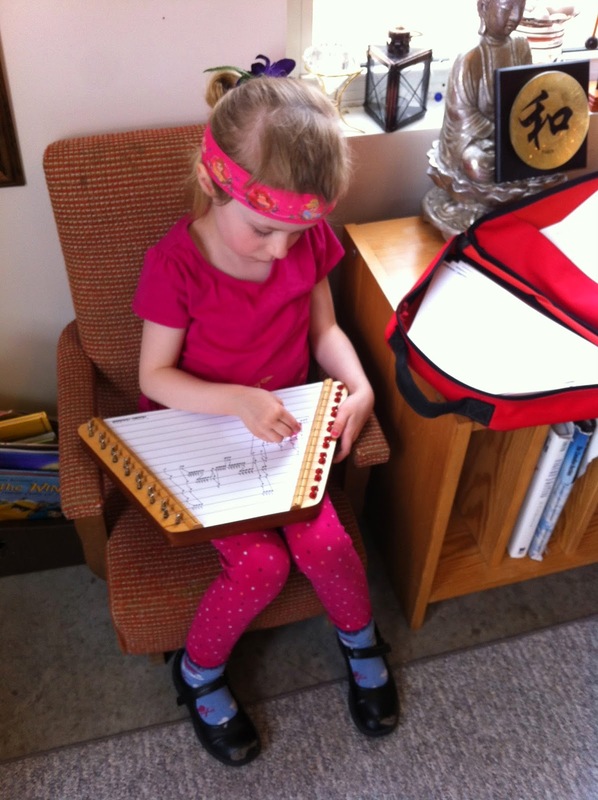 We were so fortunate to have Chloe's mom introduce us to the zither, or lap harp. The music this instrument makes is soothing and delightful. All classroom's in the school now have their very own and it's sweet sound can be heard all throughout the day. 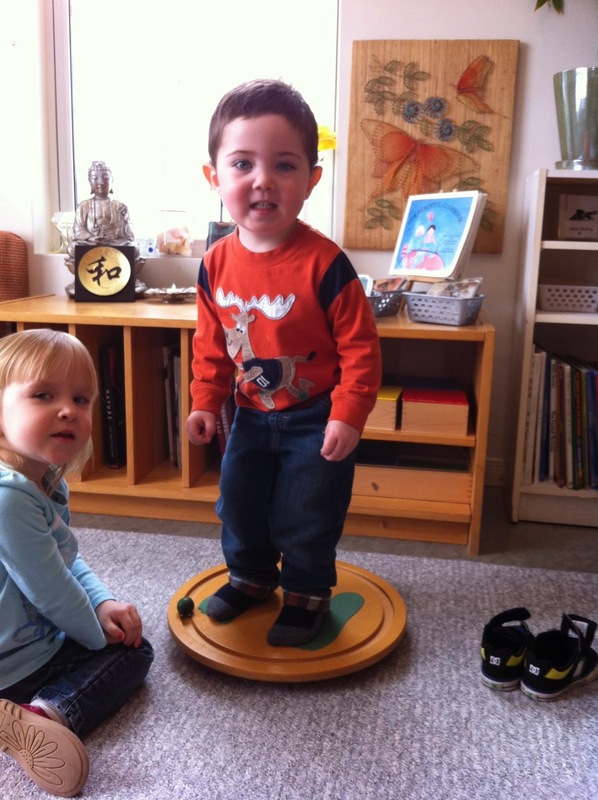 Part of the Montessori philosophy is care of the environment. 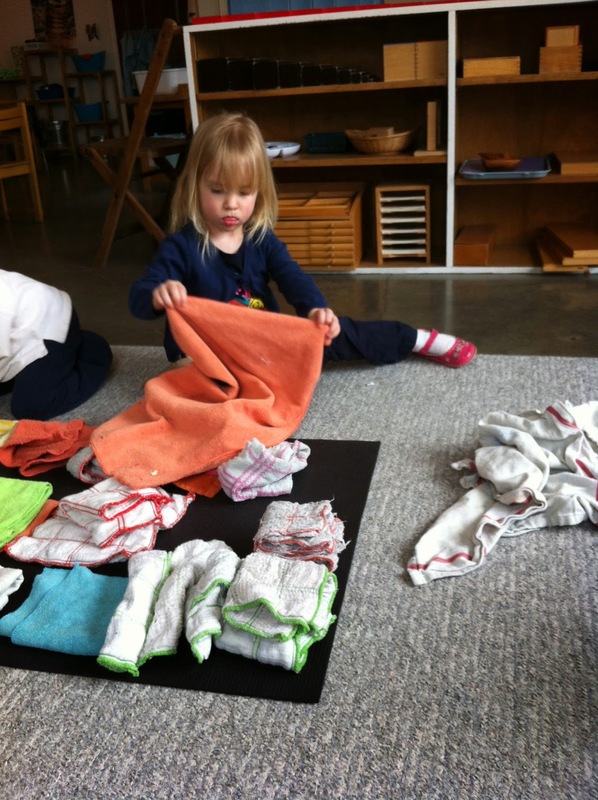 Addie is having a lesson on folding laundry, which the Casa's often do for the whole school! Emma and Violet are working on the map of South America. While going about my own work, I often walk by activities such a this and casually give the children the name of one of the countries. Little moments for learning like this present themselves all the time. As you can see there is never a dull moment! Over the next few weeks I will be working on report cards and final home book entries. As always, please feel free to comment on the blog or pop into the school for a visit. I love to chat about the classroom!